Apparently in Paderborn existed several barracks (Kasernen), as mentioned in the city's website www.paderborn.de in a chapter concerning Stadtentwicklung und Stadtplanung (city development and city planning). My lists on DP camps mostly begin in October 1945 but no doubt the camps existed before. In Paderborn at that time existed a Camp #8 with Poles, DPAC number (changing with the time) 145, or 32/145, or 24/25/3145, or 24/25. In 1947 the location in the Infanteriekaserne (= infantery barracks) is mentioned, probably concerning the same camp. This camp still existed in April 1949. A second camp also with Poles with the DPAC number 32/144 is listed from March to May 1946 in the Panzer Viking (tanks Viking, probably also barracks). A Panzerkaserne in Paderborn seems to exist still today. I did not find an address. So it might be a historical name officially renamed. I did not find on the internet any actual information on the "Infanteriekaserne". So either it does not exist any more or it has been renamed since 1949. The latter could be more likely. I found on the internet that a tram line in Paderborn going from the Hbf (Hauptbahnhof - main railway station) via Infanteriekaserne to Elsen existed until March 31, 1958. So it should be possible to find out with the help of the city's archives the exact location of the former DP camp. My book is written in German but in many aspects self explaining mainly in the lists of camps in the former British occupation zone and also by the pictures of mail, letters and cancels in the other parts of the book. It can be ordered directly with me. To the USA: $26.50 (includes shipping cost). Payment in advance in cash to my address at buyer's risk; no check and no mandate please because of the excessive bank charges. Passau (US zone) has its own page. 6/12/2015 - Please write, If you recognize any people in the photos, we'll start the labeling process, okay? "The Baltic DP university with about 170 professors on the teaching staff and 1,200 students in eight faculties and 13 subdivisions has been running for three semester. Girl Guide and Boy Scout organizations, branches of the YMCA and YWCA and sport units have been organized. The last -named have attained outstanding results well up to international standards." Baltic Refugees and Displaced Persons, published 1947 Boreas Publishing Co. Ltd. London. City site http://www.meinestadt.de/pirmasens/rathaus?cont=1 in German. Pimasens is leading German shoe and boot manufacturing center. Founded in the 8th cent. The city was heavily damaged in World War II. In Count Nikolai Tolstoy's book Victims of Yalta and in The Last Secret by Lord Bethell, we are told that at Plattling, near Regensburg, north of Munich and Dachau, a large number of Russians and Ukrainians, German Army volunteeers in the 2nd Division of General Vlasov's KONR, were, in February and May 1946 badly treated and forcibly repatriated to the Soviet Zone by the US Army. As Count Tolstoy, with whom I long corresponded, puts it...3000 'Russians' had been transferred to Plattling in late-1945 and were held there for several months. By February 1946 about half of these men - the figure was, says Bethell, 1800 - had been deemed liable to compulsory repatriation. At one point, believing that they were going to be deported and reacting like the large body of such men who had violently resisted deportation by the Americans at Dachau (where, on 19 January 1946, a number of Soviets fought pitched battles with US military police and committed suicide) barricaded themselves into their huts; a US Signal Corps film and camera team filmed and photographed the operation at Dachau while a photograph of a Vlasov man who had killed himself was published in Stars.and Stripes. The sudden, pre-deportation, appearance of military cameramen at Plattling, see below, rightly worried the Vlasov Army inmates of that large camp. The American commander at Plattling, says Tolstoy, managed to restore order by lying and saying that the Plattling Vlasovites - who had spent months there living quiet and safe lives - were simply being shifted to a camp further from the front line. 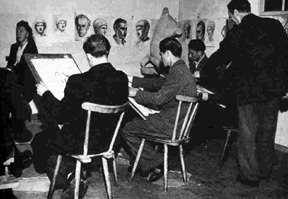 However, the men began to worry when their usual camp guard, normally provided by the men themselves, was replaced by Americans and they were asked to complete questionnaires aboiut their past lives in Russia and in the Red Army. Had many of the men not feared their questionnaire answers falling into Soviet hands,thereby making things worse for themselves and their families back home, the Vlasovites might have told the truth about being oppressed by the Communists and therefore have saved their lives by impressing the Americans with the severity of their fears.The prisoners also often refused to supply personal information. In adition to the above, writes Bethell, Russian suspicions were greatly aroused when all non-Russians were moved away from the Regensburg complex to other camps (though a camp for SS troops remained occupied), Army photographers began taking pictures of the prisoners, the camp and the huts and a 7pm till 6am curfew was imposed. (So distressed were many of the Vlasovites that when the Greek Orthodox Metropolitan of Bavaria visited the camp many men asked for the last rites. The Metropolitan asked the authorities to show mercy and to heed the prisoners' fears. In Rome, meanwhile, the Vatican rumbled into action and the Pope announced his opposition to the Western Allies - still secret - alleged denial of asylum and human rights by signing the Stalin -demanded Yalta Agreement clauses which doomed all Soviet citizens liberated or captured by Western forces to compulsory repatriation). Soon afterwards, in the middle of the night, a column of tanks surrounded the Russian camp at Plattling and numerous American troops, wearing rubber soled shoes and carrying specially reinforced night sticks, crept into each hut while the Vlasov men were sleeping, thereby ensuring almost total surprise ( at least one Vlasov soldier, seeing the tanks approaching and the US soldiers entering the camp crept under the wire into an adjoining, non-Russian, camp). Of the 271 Soviet prisoners at Dachau, where US troops using billy clubs and tear gas, had to fight their way past barricades behind which a number of inmates were killing themselves, 135, including wounded on stretchers, were transferred to the Soviet Zone that day. The survivors of Dachau were sent to Plattling where their story distressed the main camp inmates. The Vlasovites asked the camp commander for guidance. He reportedly wrote and signed a letter assuring the men they had nothing to fear. 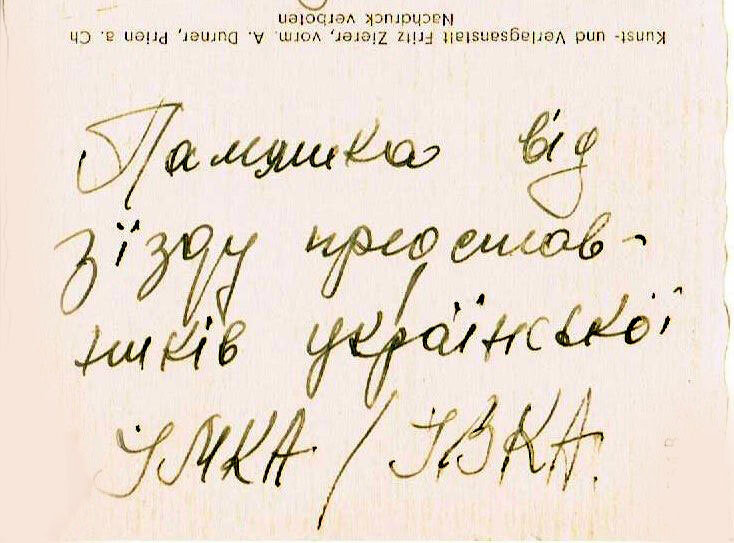 At 5:45 AM on 24 February 1946, wrote Bethell, the Russians were driven out into the night, many in pyjamas and bare feet and some with blankets. They had to stand there, said one Russian survivor, in '6 degrees of frost from 6 AM till four o'clock that evening'. They were broken up into small groups and each man had two guards. A roll call was held and two long lists were later drawn up. Two large groups were formed. As Bethell relates...according to an American report, 'in spite of the elaborate precautions taken during this transfer, five of the men succeeded in committing suicide'. So, to recap, the 1500 or so surprised Vlasov men were frog-marched to the above waiting lorries and later put on the train going into Soviet-occupied Czechoslovakia. There were no suicides in Plattling camp but there were several successful suicides and various attempted suicides before the train reached the hand-over point. Even before the American guard escorts had left the area, the Red Army began hanging Vlasovite officers, senior NCOs and others from nearby trees..
Bethell identifies the Plattling convoy's hand-over point as Schonberg, north of Munich and says that on the above evening 1,590 Soviet deportees were brutally received by the Red Army. On the 13th of May, when a second batch of Soviets were also forcibly repatriated from Plattling, there was one final suicide. As Tolstoy describes them the Americans at that location were shocked, angry and ashamed that they had been party to these killings. Their shame was visible when they returned to the camp and even the SS men in one adjacent camp are said to have shouted at the Yanks for their actions. After the operation, a number of American Other Ranks and officers both junior and senior made complaints about the forcible nature of the Plattling operation. In May 1946 a further 200-300 Soviet nationals were sent East from Plattling but that deportation was to be the last compulsory, USSR-bound, 'Yalta Convoy' repatriation exercise carried out by the US Army in Germany. 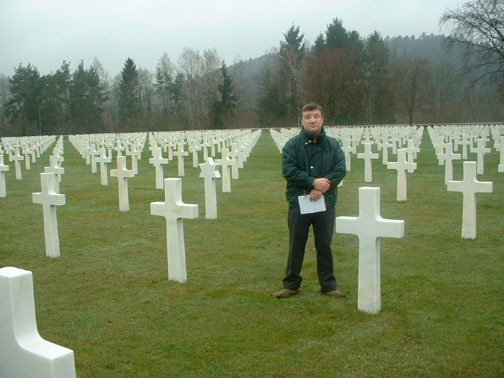 Spending the last couple years collecting documents and information on my parents WW II experiences, I've compiled my story, thanks to ITS, U.S. Holocaust Museum, dpcamps.org and others. On reviewing your site recently, I've noticed others mention some of my parent's camps in Austria. 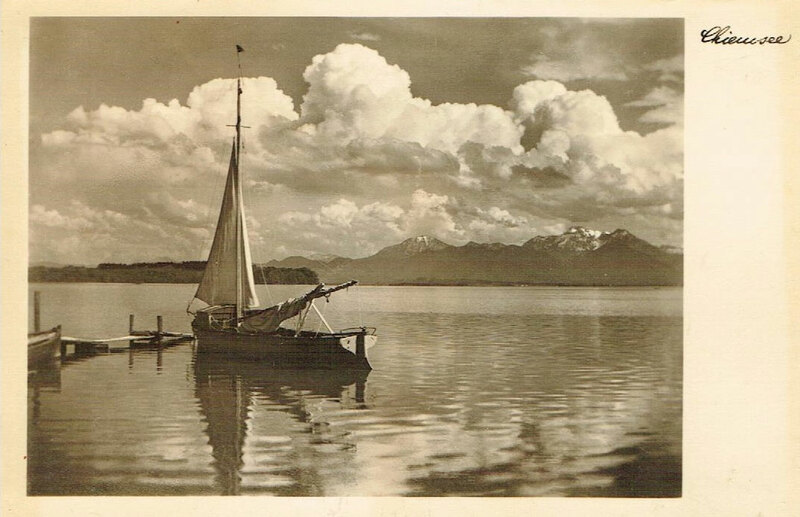 [Carol inquiring about Pongau, my parents spent a few years there, my sister was born there]. 60 Years (below) tells our story in general. where to begin to search UNRRA or IRO records. Any help you can give would be deeply appreciated. Hope this may help others. Picture of mother's workmates in Konigsee after liberation 4-11-45. Note: real shoes. 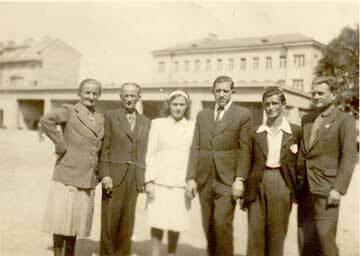 My parent's wedding, Gradimir Vlajic &Tasa Zubak, Aug. 12, 1945, Lehener Barricks, Salzburg, Yugoslav camp UNRRA Team 324 LAGER PUCH-AUFELD. My father, a tailor, made mother's wedding dress. June 1947 in St. Johann im Pongau, UN DP camp No.18. river to Glasenbach when sponsored to U.S.
front of barricks probably at St. Johann im Pongau. 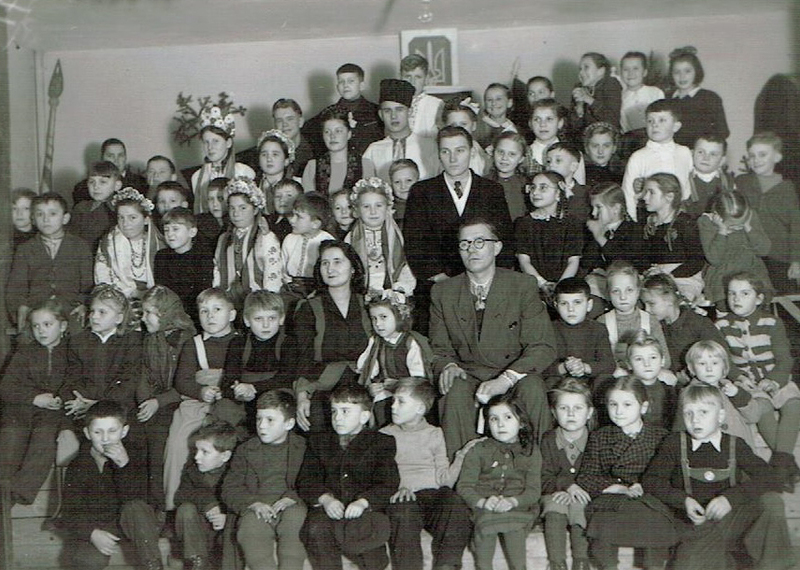 Rada standing, in 1950 a few months before coming to U.S. In 1941, Germany was aggressively expanding its frontiers. In Yugoslavia, the Nazis overwhelmed the 5th Yugoslav army as they stormed toward the capital. Gradimir Vlajic and 5000 fellow soldiers were captured. Before he reached Stalag XIA in Altengrabow, Germany[50 mi. SW Berlin], on April 13th, the Nazi flag was flying over Belgrade. 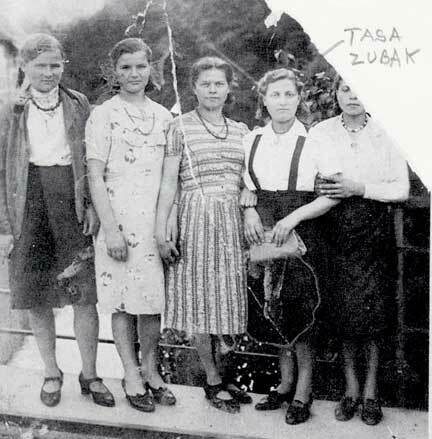 Later that year as more Germans were marching across Poland toward the Russian capitol, they seized Tasa Zubak, barely 16, along with others from her town, Letave [Khmelnts'ka], Ukraine, then near the Polish border. They, and many others were packed into boxcars and taken to Templehof, Berlin transit center for assignment to labor camps. POW'S generally fared better than forced laborers, being given work details, such as bomb cleanup, farm work,and later in the war, because of labor shortages, factory work. Forced laborers got their hair cut off, were issued worker ID cards, and an identifying badge of their origin to wear. East. Ukrainians were considered subhuman, worthy only of being worked to death, and they were. By 1944, 10 year olds were being seized to replace ones who had died. Days later Vlajic returned to find Zubak. In August 1945, they traveled to Salzburg, Austria, getting married at the Lehener Barricks, Yugoslavian DP camp. [Puch-Aufeld]. Zubak was first assigned to Mariendorf [Sachenhausen- Berlin], then others as bombardments destroyed the factories. In 1945 she met Vlajic, he being on a work detail from POW camp. Both were working at a factory in Konigsee, Thuringen [R. Stock & Co.] when the 90th Recon. Bn. attacked the town. Everybody ran. Zubak, hit by schrapnel, made her way through the smoke, over bodies and debris to hide. After securing the town, tank crews handed out chocolate to the newly-liberated laborers. The Americans also liberated nearby Buchenwald Concentration Camp and the Bad Sulza POW camp. 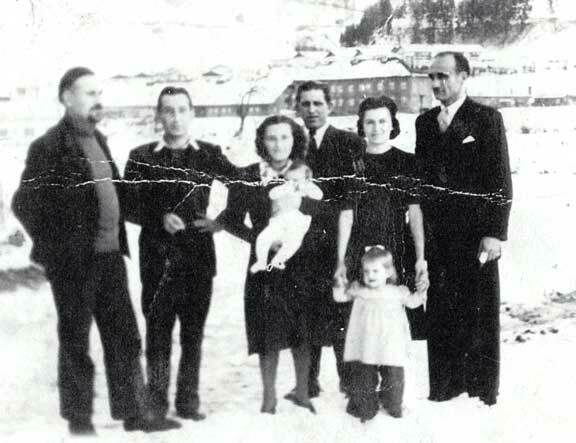 In 1946 they moved south to St. Johann im Pongau DP camp. [UNRRA No. 18, formerly Stalag 18C POW camp]. 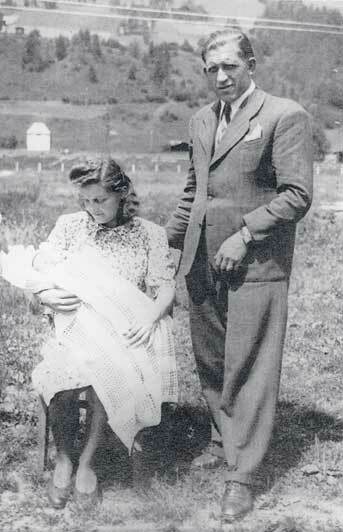 Their first daughter was born there in June 1947. 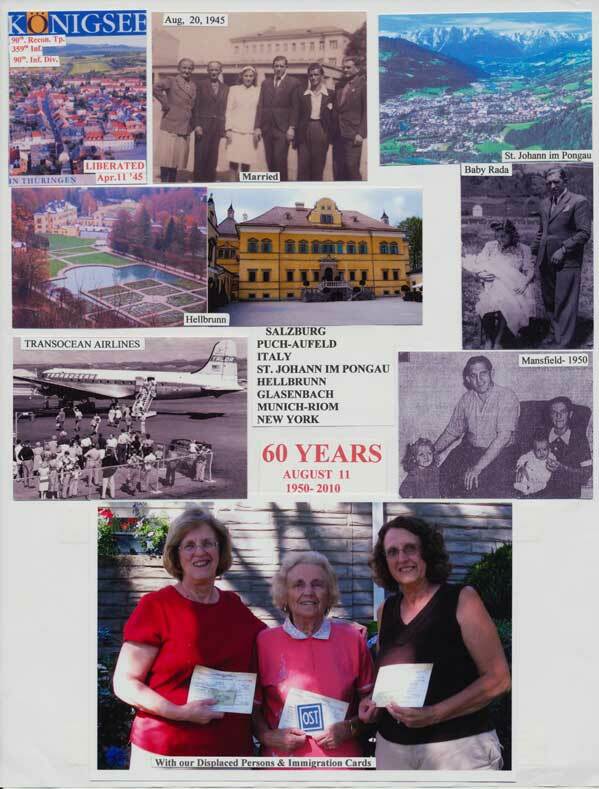 Passing up employment in Australia in 1949, they moved back to Salzburg DP camp Hellbrunn [von Trapp day residence], where their second daughter was born April 1950. 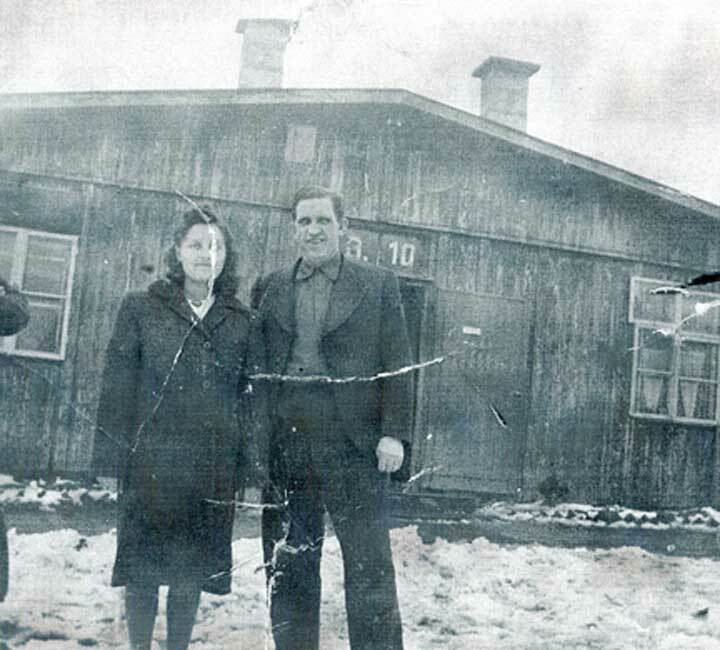 In June they moved across the river to DP camp Glasenbach, awaiting final immigration papers, after being sponnsored to the U. S. Their final trip to Germany, took them to Munich-Riom, boarding a Trans Ocean Airline flight to New York. On August 11, 1950 they arrived in New York and traveled to their new home in Mansfield, Pa. They encountered challenges faced by all immigrants. Shopping -- if you could see it, you could buy it. If it was boxed or wrapped, it could be a suprise. But they managed. Their home language was Serbian. Alter a few years they moved to Pumpkin Hill near Roseville, Pa. Within the first 10 years in the U. S. they had four more children, all boys. The girls were going to school in Roseville learning a new language, English. One recalls watching and copying the other kids. Sometimes one would call us Communist, we had no idea what it meant, but the teacher would stick up for us. Gradually the girls learned English, taking it home, their father declaring it to be the home language so they could all learn it, and they reluctantly did. About 1957 Mrs Vlajic took on a job at the Dixie Barbecue, Elmira, to help support the family. For the next 33 years she worked along with most of her children and one granddaughter, doing waitressing, kitchen duties, and car hopping. Over the years she made many friends and earned the respect of others. This little lady from the East was not one to fool with. On a warm Friday nite, after closing late, cleaning up, and setting up for the next day, it was not unusual to go home as the next day dawned. A book full of memories. Her husband Gradimir died in Sept. 1982. In 1990, she put away her order pad and hung up her apron. In 1993 Vlajic and 3 of her children visited Ukraine and Yugoslavia. In Feb. 2001 Vlajic married Matthew 'Bud' Dooley, another WW2 veteran, a U. S. Marine, 1st Division, who was one of the nearly 1300 casualities of Sept. 15, 1944. He survived the 1st day of the assult on Peleliu in the Pacific. The month long battle was one of the most deadly for both the U.S. and Japan. Dooley was a new inspiration in her life, taking her out to eat almost daily, she loved sitting at the table, giving the order rather than taking it, silently evaluating the food and service. After all, a waitress should earn, not assume tips. And so it went till health problems slowed down her husband. With her 17 grandchildren and 13 great ones so far, 60 years has passed so fast. Vlajic still shovels snow as fast as it falls [doesn't get deep that way], does yardwork most every day, and has the most flowers on Pumpkin Hill. After all, she's still a worker from the East!!! Two other links to postcards of the hotel, found on-line. From 1945-1950 my mother, my brother and I (only occasionally my father) lived not in camps but in a room in a private apartment house in Munich. For some two or so years, my father was in charge of several DP orphanages in Prien am Chiemsee (Bavaria), so he lived there, coming home only from time to time. At other times he lived in camps where he worked. When we were on the Kurši? Marios [the Curonian Spit], Soviet planes bombed us. The fishing boat that had followed us was hit and sank. Constantly on our way to Austria we experienced bombardments and strafing. Since we were the “Verfluchte Auslaender” (damn foreigners), the possibility of being taken to slave labor camps permanently hung over our heads. My mother had extraordinary abilities of survival (as a child, the Russian Revolution, in Klaipeda arrested by the German military and accused of spying for the Soviets, and incessant other harassments), so she managed to keep us and the other Lithuanian refugees that were fleeing with us (she got papers for them as our relatives) out of camps. Once three of our families reached Gratkorn (a town outside of Graz, Austria) my mother and one other woman were assigned to work in a lumber mill, maneuvering logs into monstrous saws. Description of the living conditions in Prien (Did you live in a barrack, a building, an apartment) Were there other occupants in your living quarters? How did you eat, prepare food? The city administration of bombed-out Munich had ordered that homes and apartments be subdivided, and allotted a specific square footage to refugees of all nationalities and bombing survivors. In the 4-room apartment where we lived, 11 refugees were housed. When my father would come home, there literally was not enough room for the four of us to sleep even including on the floor. Ponia Neverauskiene, who lived downstairs, would then share her room with me and I would sleep on her couch. Kitchen, toilet and bathroom were all communal. Taking turns for all needs, all common tasks, and keeping track of how much natural gas we each used for cooking, were endless undertakings. Since there was no central heating, our room was heated with a wood/coal stove. We also used it for food preparation not just warmth. The chimney protruded out the window that had been covered with some kind of cardboard. No light. After months of waiting, glass panes were installed (they had shattered during bombing raids), but a part of the window still was left covered with this cardboard to accommodate the chimney. Throughout the apartment house no warm water existed. Laundry and bathing was done in the basement laundry room where one could make a coal fire in a huge oven that had a built-in cauldron. Again we had to sign up for its use. Most memorable events from life in the DP camp(s). When my mother, my brother and I would go to visit my father in Prien finally there would be enough food! We also tasted such exotic delicacies as peanut butter for the first time in our lives. I overate and did not touch it for the next 30 years or so. In Munich we lived on ration coupons which minimally covered our nutrition needs, consequently what my father would bring back from the camps was invaluable. We were allowed to live outside the camps because my mother and at times my father had jobs not necessarily related to camps.